Classic baroque style is very heavy for the modern homes so it’s often modified to appear less imposing and it looks still very luxurious and complex. Some just add baroque elements to the traditional interior while others opt for modern versions of baroque furniture and accessories. 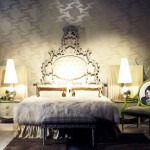 If you want to create a baroque-style home or room, bedroom, for example, bring modern baroque furnishings to the decor. 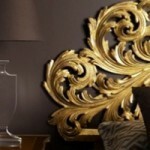 A baroque-style bed will surely make an impact in a bedroom and will set the tone for the decor. For a more classical impact go for light and gilded baroque bed frames while for the modern appeal opt for painted white or black frames. Mirrors make great focal points so adding a baroque style mirror to the modern decor will have just the right effect. It will look especially great in shabby chic, contemporary, and bohemian style interiors. Wallpaper is luxurious but a baroque-inspired pattern will add a bit more detail to your decor and will surely bring baroque style to the room. Choose the plant pattern baroque style is famous for and go for minimalist furniture or if you want a more dramatic effect opt for the bed in similar style. Baroque chandelier will stand out in a modern bedroom and will add more detail to the look. You can go for a bit more dramatic lighting like candelabra if you want something more classical. Baroque’s intricate shapes and motifs especially stand out in minimalist and traditional interiors. When subtly introduced even with furniture they can bring an undeniable luxury and allure to the decor. What baroque elements do you like more, classical or modern? Where can I purchase the Modern Interior Baroque Elements bed?